Media stories about “Russian minorities who fear for their language rights and that they fear persecution under Ukraine” continue to circulate following the Kyiv Revolution. On 3/1/2014, Christiane Amanpour casually mentioned on CNN that the new Ukrainian government had “banned” the Russian language. Banned?… Nothing could be further from the truth. 1. Ukraine is not ‘divided’ by language. 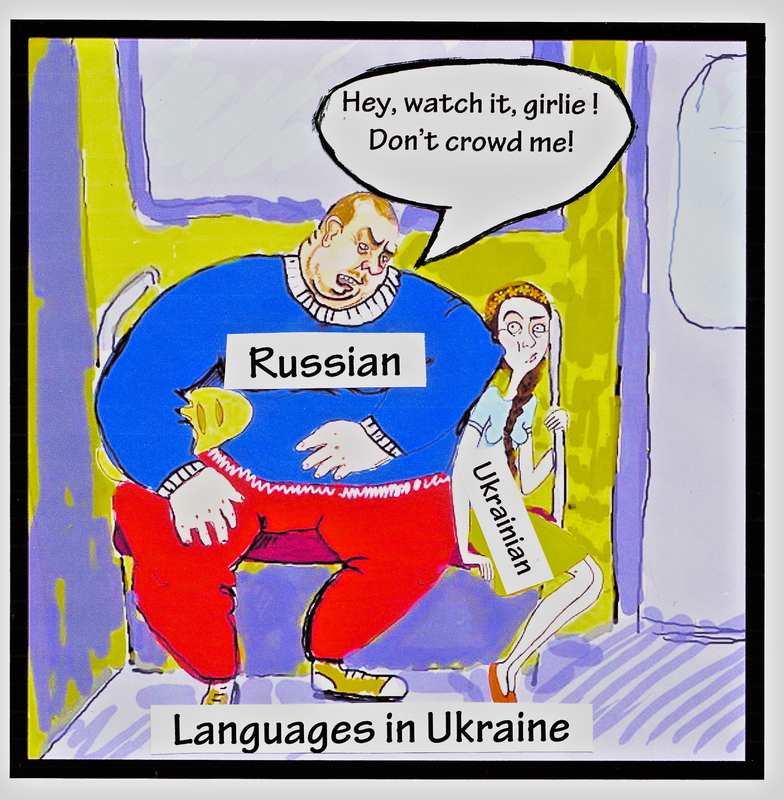 Russian is used and understood by almost all citizens in Ukraine. Most YouTube posts from Maidan were in Russian and many activists spoke in Russian to reporters. Most of the ‘Comments’ supporting Maidan posted to TV and newspaper websites were also in Russian. Every regional and language minority in Ukraine took part in the fighting on the Maidan – a nationwide revolt, first and foremost, proclaimed against Yanukovych’s corrupt government of Donetsk gangsters and the crooked oligarchs. Killed activists were from all major Ukrainian cities, including the far east and south, like Kharkiv, Donetsk, Dnipropetrovsk, Zaporizhia and also from Crimea. 2. Russian language was always protected and encouraged by Ukraine’s 1996 Constitution and all other laws. 3. Russian schools hold an enviable position in Ukraine. Take a walk in Crimea. You will see almost all Russian churches, Russian schools funded by the state, Russian books and thriving Russian culture. Check Human Rights Watch for violations of ‘Russian language rights’ anywhere in Ukraine and you will not find any. Today, wherever 15 or more parents officially desire to have their children in a Russian or other language school, their wishes are met by the government. In 2011 there were over 1,700 Russian schools in Ukraine. In fact, many such schools operate undisturbed in Lviv and surrounding towns in Western Ukraine which media sometimes describe as the center of “anti-Russian extremism”. From the very first days of Independence in 1991, all nationwide TV channels continue to broadcast news, talk shows, movies and other entertainment in Russian. No one persecuted them, no one picketed TV stations, nor staged any boycotts, ever. 4. Ukraine ratified the 2006 European Charter for Regional or Minority Languages… Russia did not. These important guidelines support the growth of linguistic diversity and tolerance for all national minorities. 5. Yanukovych’s 2012 “Language Law” aimed to eliminate the Ukrainian language. On July 5th, 2012, “The Guardian” described how the heavy-handed Yanukovych administration bulled through a controversial new ‘language law’, aimed at “marginalising and ultimately eliminating Ukrainian.” Double-voting and other irregularities by Yanukovych’s faction in Parliament drew wide international censure. The man who pushed this change through, Vadym Kolesnichenko, scornfully said about Ukrainians: “…they’ve been allowed to breed, like cats”. This was the reason for those fistfights in the Rada (Parliament). When on 2/23/2014, Parliament voted to reverse this ‘language law’ and other unconstitutional repressive laws passed by Yanukovych, this merely marked a return to the open language policy of the original Constitution. In a conciliatory gesture, Acting President Oleksandr Turchynov vetoed the Rada’s 2014 decision to repeal the 2012 language law, thereby now assigning second official language status in Ukraine to Russian. 6. Ukrainians are the ones with legitimate fears for their language and culture. Ukrainians are the real Minority in their own country. In 1863, the Tsar’s Minister of Interiors Valuev branded the Ukrainian language as the same as Russian, except for being ‘spoiled’ by Polish. “The Ukrainian language has never existed, does not now, nor will ever exist.” The notorious Emsky Decree of 1872 was even more harsh – Ukrainian books were prohibited, Russian spelling and transliteration were made compulsory, and only after censoring. The Soviet era inflicted further crackdowns on the Ukrainian language, with thousands of academicians and citizens jailed and executed for their defense of their language and culture. Specific decrees were put in place to wipe out any “differences from their older brothers tongue”. You can still encounter a similar disdain and even hate for spoken Ukrainian in Crimea and some cities in the East. 7. Rights of Ukrainians in Russia are systematically violated. More than 3 million ethnic Ukrainians live within Russia. There are ten Ukrainian Sunday schools and merely a dozen schools with Ukrainian as an optional study language throughout all regions of Russia. Petitions to authorities remain unanswered. There are no Ukrainian-language newspapers nor radio nor TV broadcasting in the Russian Federation.